^ Mallon, D.P., Sliwa, A. & Strauss, M. 2011. Felis margarita. The IUCN Red List of Threatened Species 2011: e.T8541A12917127. http://dx.doi.org/10.2305/IUCN.UK.2011-2.RLTS.T8541A12917127.en. Downloaded on 28 June 2016. 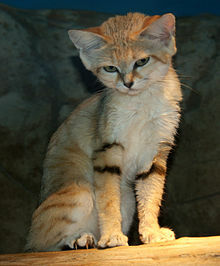 ^ Abbadi, M. Israel's elusive feline: sand cats. Cat News. 1992, 18: 15–16. ^ Mendelssohn, H. (1989). Felids in Israel. Cat News 10: 2–4. ^ Nowell, K. and Jackson, P. (1996). 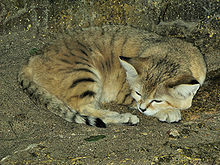 Sand Cat Felis margarita. in: Wild Cats. Status Survey and Conservation Action Plan. IUCN/SSC Cat Specialist Group, Gland, Switzerland and Cambridge, UK.